Visiting a loved one in the hospital seems simple enough, you go to the hospital, say hello, stay for a while, then leave. It may seem simple, but it really isn't as simple as it may seem. Many well-meaning friends and family members get it wrong and make it difficult for the patient to get the rest they need to get well. Patients typically get very little rest. They are being woken up by staff throughout the day and night for vital sign checks, medications, to be weighed and for procedures. It is common for patients to be exhausted when they get home from the hospital because their sleep is constantly being interrupted. If you can tell that your loved one is exhausted and in need of sleep, it may be time to cut your visit short. If your loved one insists that you stay, consider sitting quietly in the room and allowing them to doze, rather than expecting an ongoing conversation. If you have a cold or the flu, do not go to the hospital. There is a good chance that you could make already sick people even sicker. Also, if you are struggling with a serious illness such as cancer or your immune system is weak, you could make yourself sicker by visiting and being exposed to the germs and viruses that are present in the hospital environment. The hospital staff is your best guide to a well-chosen get-well-soon gift. Many areas of the hospital do not allow fresh fruit, fresh vegetables or fresh flowers, so avoiding these types of presents may be necessary. Remember, you don't want to make your loved one or another patient have a sneezing fit or an allergic reaction when they are trying to get well. Floors that treat cancer and administer chemotherapy will typically not allow plants of any type, including fruit and vegetables, to be brought into the area. This is to protect patients with decreased immune systems. Also, many patients are on food and liquid restrictions, so gifts of candy, food, and drink may not be allowed. Let the patient guide the topic of conversation. Let them decide if they want to talk about their condition beyond the basic, "are you feeling any better today?" Some people crave the normalcy of regular small talk and don't necessarily want to talk about the procedures they have had, the diagnosis or anything related to their illness. Others are embarrassed by talking about their body and will avoid the topic entirely. That said, your family member may be one of those patients who loves to share every minute detail of their hospital stay, and that's ok, too. The hospital has visiting hours for several reasons. First and foremost, the hours ensure that the patient gets some sleep. The visitor-free hours also give the staff time to help the patient with things that friends don't need to see, like baths and grooming. Many hospitals restrict visitors during shift changes; this is so friends and family members don't overhear private health information that is exchanged between staff members. The hospital is not the appropriate place for a loud argument about family finances, who is to blame for an injury or any other topic that may start a fight or cause anxiety. It is a shameful fact that families do come to blows in the hospital waiting room or right in the patient's room. This behavior is unacceptable and will result in visitors being removed from the facility by security, and they will be banned from returning to the bedside. Many facilities restrict visitors to two at a time, as some patients have very large circles of friends and family. Typically, if there are many people who would like to visit, the visitors will be in the waiting room and take turns going to the bedside in small groups. If the visitors are limited, and the patient wants their closest family at the bedside, do not be offended. If you were ill and scared, you would want the people closest to you to be at your side. More than 2 visitors at a time can make it difficult for staff members to do their job and move around the room. Requesting permission from the nurse caring for the patient for additional visitors is possible, and may make it possible for more people to visit for a short time. Be ready to step aside, move your chair or leave the room if the staff needs the room to provide care. Some of the equipment that the staff utilizes, such as a portable x-ray machine, is quite large and can be difficult to fit into small hospital rooms. Do not wake hospital patients. Remember that the patient is in the hospital to get well, not to entertain guests. Waking them to say hello or to let them know you have arrived is not beneficial to their well-being. Sit quietly in the room and wait for them to wake or leave a note, but don't disturb their sleep. It shouldn't have to be said, but it happens routinely. Do not eat the food provided for the patient. Food and drink provided to the patient are often measured and the amount they ate is recorded so that the staff knows if they are taking adequate nutrition. Some medications can be ground into powder and mixed into food to make it easier to take, so eating the patient's meal may mean that you also take their medication. Unless there is an extremely good reason to do so, avoid bringing children to the hospital. Many hospitals restrict young visitors unless there are special circumstances such as an extremely ill family member or the birth of a sibling. Hospitals can be very scary places for children. They don't understand what is happening, and if their loved one is in the ICU, they are likely to be terrified by the appearance of the patient. Also, small children often want to be on the floor, touch equipment and be on the bed, which is not safe for them or the patient. Many people think of hospitals as a very clean place, but in reality, no matter how clean a hospital is, it is full of germs and viruses that can make children ill. Avoid bringing a child to the hospital whenever possible, and if it is necessary, take care to wash their hands frequently. It is a good thing to be willing to help your loved one, but some people can get carried away. If your loved one is perfectly able to get up and go to the bathroom, don't feel the need to fetch their toothbrush and have them brush their teeth sitting in bed. Getting up and moving, even when it is painful, is often the first step to going home and recovering there. You cannot take care of your loved one if you aren't taking yourself. When people are seriously injured or ill, family members often neglect their own needs for days on end. It is completely appropriate to go home and sleep, eat, shower, change clothes or even relax and watch television. You won't be in a position to help anyone if you are not taking care of yourself. Having a loved one in the hospital can be exhausting, which can make driving to and from the hospital dangerous, so take care to sleep enough. 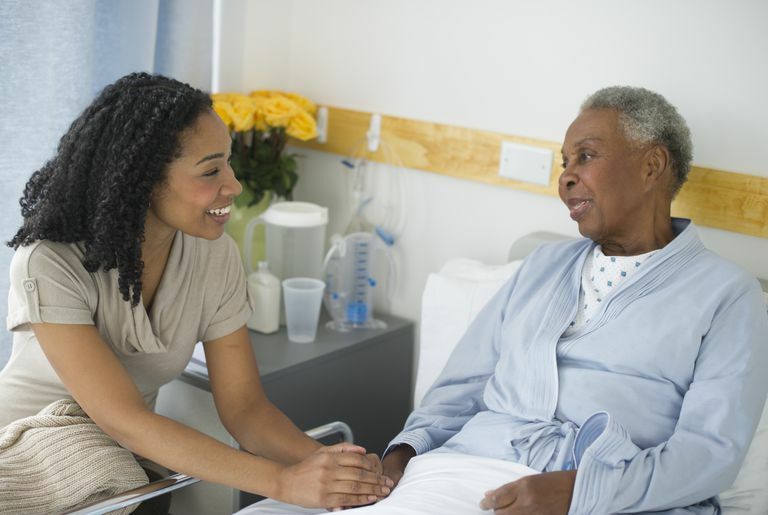 The staff taking care of your loved one is there to help restore them to good health. Be respectful of their requests and needs. If the staff asks you to step out of the room for a bath or procedure, do so graciously and without argument. Do not argue about leaving when visiting hours are over, requesting additional time or an exception to the rule is much more likely to result in additional time being given. The Good Hospital Visitor-What Not To Do When Visiting Patients. Jari Holland Buck.